It appears that Chicago Mayor Daley retains his number one green roof mayor position, with Washington D.C. a distant second. I have not been able to find a ranking for white roofs. There is apparently no "White Roofs For Healthy Cities" organization. If there was, would New York and Mayor Bloomberg top the list? This green roof conference in Australia will also include green walls (aka living walls), one of the hottest topics in urban greenscaping. It is revealing that a site search on the word "food" produces over 80 unique hits. The Aussies get it! We are pleased to announce that the 2010 Green Roofs Australia Conference will be taking place from 20 – 23 October, 2010 at the Adelaide Zoo, South Australia. This year’s conference promises to be our biggest yet and will include a welcome reception, pre-conference workshops, two days of presentations, conference dinner and green roof and walls tour. We are pleased to introduce Ed Snodgrass, Founder, Emery Knoll Farms and Green Roof Plants, U.S.A. and Paul Kephart, Executive Director, Rana Creek Living Architecture, U.S.A. as your international speakers. Save the date and stand by for more information on how to register for this year’s conference. To download a conference flyer and spread the word, please click here. I happened upon this little horticultural joke on the Department of Horticulture Green Roof Research Program at Michigan State University. Sedum is a genus of succulent plants used widely for passive green roofs because they require little or no irrigation. Cucurbitaceae is a plant family commonly known as melons, gourds or cucurbits and includes crops like cucumbers, squashes (including pumpkins), luffas, melons and watermelons. These plants are obviously on the opposite end of the plant spectrum. So, get it? They probably didn't even need to Photoshop the watermelon into the photo. It was simply placed on top of the sedum. What isn't as funny is that this research program appears not to include rooftop "urban agriculture" as suggested in the photo caption. For one thing there are no site-search hits on the words "sub-irrigation", "self-watering" or anything related on the entire MSU horticulture website. We vitally need research on all modern methods of growing food in the city other than dirt farming and it isn't happening from what I observe. Most of these horticultural schools are still living in a prior horse and buggy century of rural America. Incidentally, if you want to learn more about green roofs, green walls and food production treat yourself to a vacation in Australia in October this year. This flower garden is on a Brooklyn rooftop. No, this is not a planter bed. 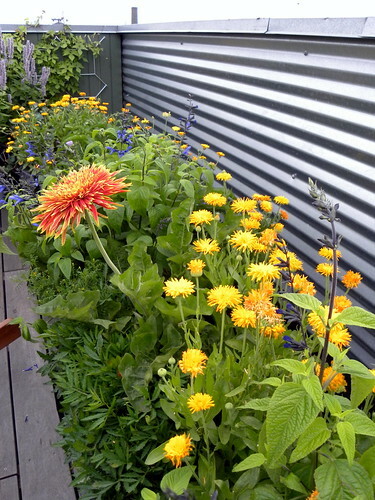 This spectacular array of flowers is growing in portable sub-irrigated planters (SIPs). Compare it to this rooftop garden of similar nature. These SIPs are the do-it-yourself tote box type. I collaborated with the owner on this project last summer. She did a superb job of plant selection. The plant selection and design was all of her own creation. I provided consulting advice regarding making the SIPs and growing in them. This is just a small sample of the results. There are over 70 SIPs that grew flowers, perennials and an incredible variety of vegetables. For a variety of reasons the project was not published. I look at projects like this from all over the country and have not seen its equal. It warranted a design magazine feature article. Stay tuned, it will bloom again in the coming year. This is one type of green roof system. The layers shown in this photo can be used to support a sedum type (extensive) green roof. Be aware that there are other approaches to the green roof "sandwich". Here, a felt wicking layer (white material) sits on top of a moisture retention layer (gray molded cups). Water in these cups is wicked up into a soil layer supporting growth of low water using sedum plants. You might think of this as a form of sub-irrigation. As you can see, however, the moisture retention ("egg cups") layer provides only a small reservoir of water. This isn't meant to be a sub-irrigation system to support larger plants such as vegetables.